The Power of Spirituality in Therapy combines psychotherapy, spirituality, and humor to examine the pink elephants of academia-Godphobia and institutional a-spiritualism. 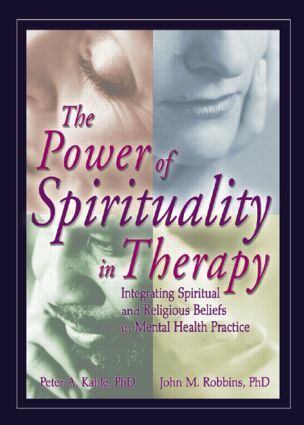 The book explores the learned avoidance that has historically limited therapists in their abilityand willingnessto engage clients in God-talk and presents clinicians with methods they can use to incorporate spirituality into psychotherapy. Topics such as truth, belief, postmodernism, open-mindedness, and all-inclusiveness are examined through empirical findings, practical steps and cognitive processes, and clinical stories. Odell, Foreword. Acknowledgments. Introduction to a Journey. Section I: Jousting With the Pink Elephants. Walking on Silent Eggshells. Sources of Influence. The Influence of the Person of the Therapist. To Be (Ethical) or Not to Be? What Is the Question? The Influence of the Pink Elephants in the Ivory Tower. Can We Agree That Many Have Disagreed? Valuing Values in Psychotherapy. In God Do Therapists Trust? In Reality, Better Training Is a Must! Section II: How Then Shall We Counsel? To Believe or Not to Believe? That is Not the Question! The Integration of Religion, Spirituality, and Clinical Practice. Learning from Our Clients. The Power to Help. The Power to Hurt. The Deification of Open-Mindedness. God and Akelia: The Freedom That Binds. In Reverence of Power: Moving Toward Competence. References. Index.